“I’m Not Very Impartial When It Comes To US Politics! x” said the BBC journalist. I’m going to set my alarm for 2am to watch the Presidential #debate on BBC News. I am. Honestly. UPDATE: As you can see above, someone has forced a little impartiality on Jude after all. Awww. I’m currently having difficulty uploading the screenshot I took at the time, but fortunately DB took one and posted it in the comments below. 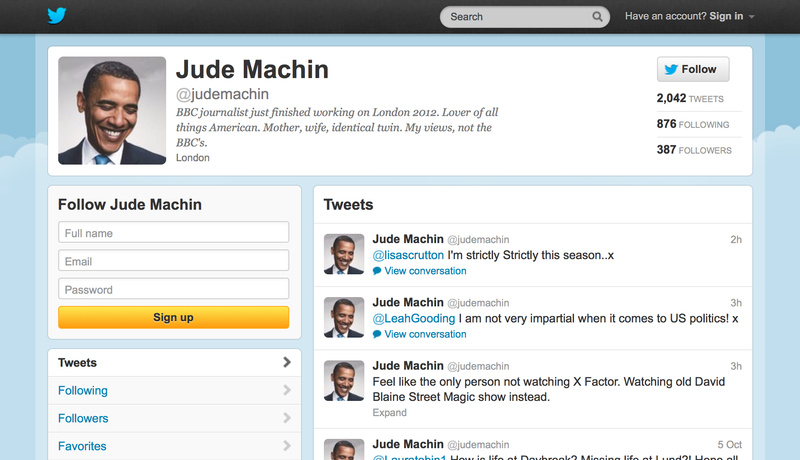 @judemachin Love your profile pic Jude! The sister worshiper is Leah Gooding, BBC Newsround presenter. They’re all at it, and they don’t care about showing it in public. Ms. Gooding doesn’t have the requisite “views my own” get-out-of-bias free card that most of them do, but neither does she have the BBC logo. So she’s probably beyond the reach of the BBC guidelines. Are these tweets proof of biased reporting/presenting on their own? No. But added all up, they create a profile of the very kind of echo chamber fellow Left-leaning BBC journalist, Kate Dailey, was warning against only yesterday. It has to affect BBC reporting on some level. If they all share the same approved thoughts anyway, it will happen naturally, without conspiracy or awareness. Time for some more social media training courses, I think. Somebody should ask Helen Boaden if this is the kind of thing she was talking about when she asked staff to engage the brain before “rushing to communicate“. UPDATE AGAIN: Below are the screenshots. 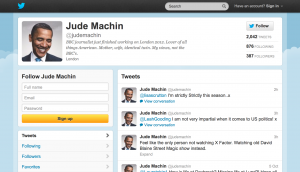 I’ve left the above embeds as is, in order to show that Machin’s Twitter account has been sent down the memory hole. That’s why there’s no more profile pic. It’s possible she killed it once I told them I had screenshots. Another round of training is in order, I should think. At your expense. Tagged Jude Machin, Leah Gooding. Bookmark the permalink. 59 Responses to “I’m Not Very Impartial When It Comes To US Politics! x” said the BBC journalist. This TV/Radio network has to go. Oh and by the way, how about the new, dumbed-down, patronising, newsround-style, news updates around half seven in the evenings? complete with elfin-lady reader. wtf is that all about? What your post demonstrates is that the BBC is stuffed full of like minded liberal left wing supporters, the natural result of which is that internally there is no debate. They all think alike, and report the world through the lens of the left wing agenda. A lack of any internal debate leads to an effective institutionalized bias where only viewpoints that are considered to be to the right side are ever challenged. The liberal left wing bias of the BBC is on show for all to see, and the most troubling aspect of these tweets is that they obviously feel no sense whatsoever that what they are doing is likely to be challenged either by their employer, or our feeble politicians who are asleep at the wheel. Very good but, I would take issue with the description of beeboids as “liberal”. As with the Lib-Dims, they are neither liberal nor democratic. But neither would recognise the truth if it bit them. I know that it could result in the sad sight of BBC staff throwing themselves off of the roof of broadcasting house but can I propose that the Murdochs take over the BBC…Do I have anyone to second the motion!! I would love any of the Murdoch’s to be the DG job! Just to see left wing heads pop all over the country. I honestly feel these days that if one wants a more rounded, more impartial view of current affairs one is better off watching Sky News. And I really never imagined I’d feel this way, but the BBC has latterly (for me, at least) become so blatantly left-leaning, so contemptuous of ‘impartiality’, that I have felt forced into watching Sky News in its stead. It has been a breath of fresh air – to see news and current affairs reported by journalists who don’t appear to have a drum to bang. Isn’t this what all journalists should aspire to, especially those working for a publicly-funded broadcaster? I’ve only had my Sky subscription for a year and I started out…well, let’s just say I was in two minds that it would prove its worth. In actuality, it has been a welcome sanctuary away from the hectoring, Marxist bulletins of the BBC. So nice to see politicians of all parties given a platform and ample time to make their points – they certainly don’t get an easy ride (and that’s quite correct), but they do at least get a fair hearing across the board. Not something anyone with even a hint of common sense could say about the way the BBC currently claims to ‘report’ current affairs (or anything else for that matter). Time we abolished the license fee once and for all. Let’s see how many takers there are for a subscription-only BBC..? Sky is also very left wing, although not as blatant. The real problem is that journalists are coming out pre-programmed to be left wing as this is the status quo in the universities. Then you have the moral obligations imposed on them by NUJ and there you have the total package. To your average, common entry level, journalist all their thoughts and output are normal within their own paradigm. They live in the rarefied strata of special entities who are untouchable. pre-programmed to be left wing as this is the status quo in the universities. So are you saying that only people who are too stupid to go to university are right wing? Certainly that famous quote of JS Mill would back that up. I meant to say that stupid people are generally Conservative. I believe that is so obviously and universally admitted a principle that I hardly think any gentleman will deny it. You do know that the NUJ has very little influence anymore? The closed shop ended a long time ago and you don’t have to have an NUJ card? Nicked emus repent before it is to late or you will suffer eternal damnation in the lake of fire. Strange that, when industrial action has been called at the BBC recently it was called by the NUJ. So what.? Trendy smartass academics are generally left wing. Being clever doesn’t make you right. Depends what you mean by clever – . Some people can theorise and pontificate for hours but could not change a light bulb. It is a curious coincidence isn’t it that Nicked Emu is on the Left and is a BBC apologist. Come to think of it all the defenders of the BBC on here are on the Left. What is it about the Labour supporting BBC that makes them so keen to defend it against any criticism? The Tories are the only ones in whose interest it is to call for an inquiry into the political bias at the BBC. The trouble is, the Labour spin machine would then make mincemeat of them, which is why the Tories won’t do it. It will therefore never happen until Cameron and co. get their act together and start giving as good as they get and give the lying, smearing, country-wrecking socialists the real kicking they deserve. Why would the Tories give themselves a real kicking? There is of course a pertinent aspect to that which may have had a bearing on delivery, explaining if not excusing such as Mr. Vine’s excavations passing on the views which are, apparently, his brother’s. Ms. Boaden’s effectiveness hence looking questionable at best, especially or the money we are compelled to provide to help pay for her. I used to think that the BBC needs reform to get it back to where it was when it was great (pre 1970s). Now I know it has gone too far and can never be changed back to its old honest self and the only thing for it to be destroyed completely, leaving just the memories (for those of us old enough to remember) of a once great organisation. It’s not just the bias it’s the general dumbing down. Someone recently mentioned the Proms as the last of the decent things the BBC still does. Even they have been dumbed down significantly from what they were. For instance, every year now there is at least one Prom dedicated to show or film tunes. That’s fine in a general sense but the Proms are the one outlet for classical music. There was even a Prom dedicated to Michael Ball a few years ago. There are so many outlets for popular music they don’t need to waste the one time in the year when classical music is to the fore. I say this as someone with an extremely wide taste in music, but this is a perfect example of the BBC patronising what they think of as the plebs. It’s certainly not what Henry Wood had in mind when he wanted to bring “serious” music to the masses. He knew that those lower on the social scale were just as capable of appreciating fine music as anyone educated at Eton or Haverstock, all they needed were competitive prices. As a result they flocked in and that was fine until the lefties at the BBC decided that they know best what the “people” want. Not another boring rant about the BBC and Obama from someone who doesn’t even pay the licence or live here. Where’s the Tory party coverage? Has the BBC been suckered into reporting Hunt’s rant to cover up the real debate on what is happening in the NHS and the rail fiasco? Boris is manipulating the press so how are the BBC dealing with the undeclared future leader? And lots more. The US election is an utter yawn. Whoever wins, not a lot will change as it hasn’t in the 50 years I’ve watched them. Soz I think you maybe mistaking this site for the guardian ! Prole, I didn’t say anything about the President. I merely invoked His name. To which rant are you referring? I see you are unable to address the issue itself. If you think nothing has changed in 50 years of US elections, your own ignorance needs to be addressed. The direction of American foreign policy has been co-opted over the last 100 years and the once fiercely independent and proud nation has been cowed and slowly dragged into global subservience to an internationalist corporatist agenda, which serves elite international banking families, rather than the American people. That agenda has been increasingly followed since 1913. It matters not who actually wins the Presidential election, because both Romney and Obama serve the Central Bankers before they serve the people of the USA. You have a corporatist President and a corporatist candidate vying to implement a corporatist agenda, which taxes the people more to give the elite more and the people less and less. They have destroyed capitalism, free market competition and civil liberties. The USA is NOT the land of the free, so long as any President can order the “disappearance” of any citizen without charge or trial, or even the summary execution of any citizen of the USA without charge or trial. Check your laws, check what defines a fascist state. The USA is now a fascist state! The land of the free and home of the brave? Not for a long time and this upcoming election will do NOTHING to change the direction America is heading in as it submits more and more to the UN’s Marxist fascist global agenda in pursuit of “tackling climate change” and “Agenda 21” and “Codex Alimentarius” All global standards which are opposite to the values upon which the USA was founded. Very very little has changed from Bush being in power, and very very little will change if Romney wins, regardless of the rhetoric and empty promises of both corrupt, treasonous candidates. By all means wrap yourself up in a comfortable fantasy that your vote will make a difference, but it won’t. If it did, then the elite would ban elections. They have their plan, they have their puppets in both parties and in the media to make sure that their charade plays out as they desire. That there are no dissenting voices on BBC news and current affairs broadcasts is scandalous. Biased-bbc should organise an e-petition to demand a parliamentary debate on the lack of balance in BBC news programmes. Any BBC journalist who values their professional integrity wouldn’t dream of being so brazenly biased. The fact they’re so brazen says it all about how deeply such bias permeates the BBC. There’s more than enough material to justify HMG appointing a commission of trusted, honourable journalists to carry out a root and branch purge of the BBC to restore its integrity. It’s not just routine noncing at the BBC that’s been an ‘open secret’ for the last 30 years. Might be a tad difficult finding those “trusted honourable journalists” though. Though the link between those who claim trust but are without honour, and those they seem so keen to support to the point of self-censorship, may indeed bear some consideration. Bah, another extremist banging away at the keyboard in his mum’s house, part of the tiniest, most microscopic fringe element that nobody listens to, and certainly has no connection to the general public’s opinion. Quite apart from anything else, isn’t it just plain odd when journalists are gushing fans of any politician? One expects a certain level of detachment and, if not outright cynicism, at least some healthy scepticism. Did reporters such as Machin, Gooding, and Donkin really go into journalism so they could act like adolescent cheerleaders for the most powerful man in the world? Their adoration of Obama is better suited to a cult than a newsroom. Oh, dear, looks like a bit of impartiality has been forced on our Jude. Good thing I kept a screenshot. Indeed. Like so much in the current BBC narrative, this is another aspect of their activities they seem to at last have realised is not really working on the 110% professional integrity front, at least as clear factual evidence to public view, and it has also been quietly ‘evolved’ away. “Mr Obama was widely seen as having lost the debate after a hesitant performance in Denver – the BBC. “A hesitant performance”. Don’t you just love it? The BBC has been scrambling to find excuses for Him. It is probable that the ardent liberal minds of the BBC/Guardian axis will simply not be able to cope with a defeat for Obama. He has come to symbolize the hoped for dream future of their world view. Essentially reality denying but emotionally satisfying. If we see every tweet and comment in this light then we can begin to understand the motivation. I have no idea who will win. I suspect , so great is the lure of the unreal and the illusionary, that Obama will just manage it. At least the Liberal /left will stay a little quiet for a while. “He has come to symbolize the hoped for dream future of their world view” Exactly. Obama is America’s first “Ink Blot Test” President. What you see is what you want. Democracy requires a free market in news, and we don’t have one. We have in the bBC, in Pat Condell’s immortal description, “white middle class left wing pricks” telling us what is happening, who is making gaffes, who is winning, and why anyone opposing The One’s are racist far-right nutjobs. For now Obama but next, our elections. The bBChas betrayed its trust, and protection through unique funding means it is beyond accountability. Unforgivable, and Cameron is asleep at the wheel – of the Westminster bubble car. I’ve just been lied to by the BBC complaints dept. Bullsh!t. We’ve all seen that Machin described herself as an “Obamamama”. I assume the poor complaints drone who has to deal with this didn’t know, and was merely passing along the response from BBC News Interactive, who was passing along a blatant, proven lie from Machin. Reply to them, tell them the information they are missing. The email had the “do not reply to this email, you must restart your complaints process using the Case# via the website form” brush off. 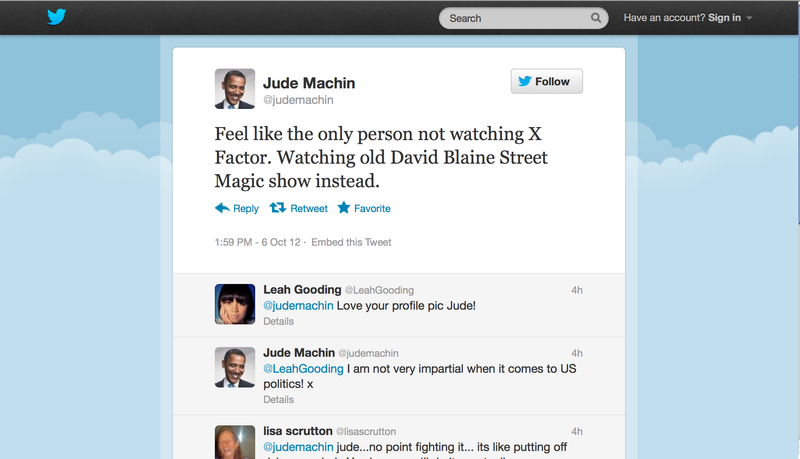 My reply will be that Jude Machin is a liar, and I’ll link to DB’s screenshot of her “Obamamama” profile and where she said, “I love him!”. Here’s another journalist declaring her love for Obama, and this time they can’t use the “not covering America” excuse. Another one for the list. Nearly 100 now. Good catch as always, DB. I’ve escalated my complaint about Jude Machin’s Obamessiah photo and declaration of bias. She has now deleted that admission from her Twitter page, but interestingly it’s still appearing in the embed I put in the main post. Anyways, I submitted a complaint about the BS response to my original complaint, including the Case #, as I think that’s what the reply told me to do. I said that the reply I got was “untruthful”, and that Machin lied about innocently choosing that photo. I told them I had screenshots of her admission of bias as well as that Obamamama thing with a picture of her and her Obamessiah-branded water bottle as proof. We’ll see if they continue to blow it off because I’m a foreigner. Not too sure that will or should cut much ice, as they are broadcasting worldwide under the banner of a trusted global media organisation. And they are, for sure, ‘reporting’ in an aggressive and comprehensive way about the US election, which affects us yes, but you more. So lying and stealth editting is not really the deal when you are a rather tarnished national treasure at the moment, especially with an already poor credibility for not covering up very well. Unbelievable arrogance and contempt has the capacity to go beyond acceptable limits, and catching BBC CECUTT in default blow off mode without reading your complaint or checking with pure, visual contradictory fact is always fun to see them respond to. Prepare for months of hurdles, and Directors getting comfy in their own rectitude, but if you stick with it even ‘The Trust’ will struggle on this one. Re: the foreigner deal, I forgot to mention that the response to my initial complaint mentioned that Machin didn’t work for BBC America and worked in the UK. As if that mattered. So it’s okay if she’s biased when she’s talking to you guys? Can only speak for myself, but no, it’s kinda not. Their resorting to semantics can buy a brief respite, but more and more times are just compounding the doo-doo they are digging themselves into. If you embed a tweet and it’s subsequently deleted the basic info remains but the avatar disappears. where all “[” and “]” are replaced with “< " and ">“. That’s the bit that includes the avatars and stuff (don’t know if you noticed but I added it to each tweet in your original post). Good luck pursuing the complaint. Thanks, DB. I actually checked one of your comments to see how you did that, and noticed that script. I just couldn’t get it to work right and left it out. Must have copied it wrong or something. As soon as the site box gets solidified and I can upload images again, I’ll put my screenshots in the main post. BBC foreign correspondent Lyse Doucet delivers this year’s Huw Wheldon Memorial Lecture, talking about how social media is transforming broadcast journalism. She examines the effect that social networking sites and tools had on the reporting of major stories from 2011, including the Arab Spring and the London riots, and considers the lessons news organisations must learn as they seek to harness the power of this evolving resource. Oh, dear. 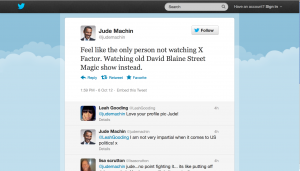 Jude Machin’s Twitter account seems to have been sent down the memory hole. Seems the e-shredders are also at work across the BBC. How their ‘account holding’ market rate talents rationalise their avowed commitments while they seem to spend more time covering up or excuse-making than reporting, will be interesting.